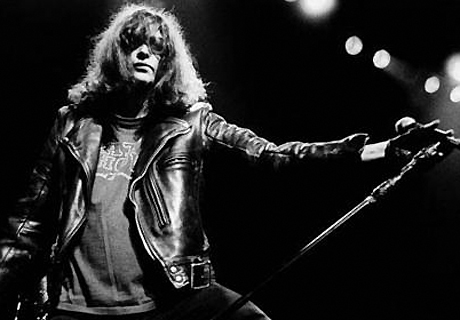 In the years since Ramones frontman Joey Ramone's death in 2001, the late punk singer has released two posthumous solo LPs (2002's Don't Worry About Me and last year's ...Ya Know?). Now, fans have the chance to own even more of the iconic punk singer's records, specifically his old LP collection, via an auction of his personal belongings. As Billboard reports, an online auction house is set to sell 97 records from Ramone's personal stash, including platters from Led Zeppelin, the Who, T. Rex, Cream, Bob Dylan, the Human League, Iggy Pop, the Doors and the Temptations. Although it's described as being in good condition, there are apparently "various scattered creases and small tears to sleeves, affixed prices tags and labels, and marks to vinyl." The sale comes with an authenticated note from Ramone's brother Mickey Leigh. A minimum bid of $500 is being asked for, with the auction running February 14 to 21. The Joey Ramone Estate is also offering up other mementos from Ramone's life, including a rolodex full of famous contacts, some T-shirts, a few pairs of sunglasses, guitars and a passport. You can find out the details on all of the auctions here.